After much failure and desperation potty training my first son, I made this visual schedule. To my surprise and delight, it really helped him with the process planning. We were still in the midst of realizing he needed an autism diagnosis and running around trying to make that happen, so at the time, visual schedules were very new to me. Unfortunately for us, his interoceptive sense is clearly impaired, so even though it helped him with the "how" he still sometimes struggles with the "when." The reality is that it took over 4 years from when he first indicated interest in the potty to when we could mostly consider him able to know when he has to go during the day (nights are another thing). Because of that, I pretty much hate anyone with a "my kid potty trained in a week" story. They can go right to hell. But on their way, if they could pick me up another package of pullups that would be great because I forgot them at the store today and I don't want to do the sheets again in the morning. This came up because we're entering potty training hell with the little Dude. Although Dude doesn't seem to be as challenged by it from a sensory standpoint, he's giving it the full blown 2 year old treatment. Going on the potty was AWESOME when it was his idea - one weekend a while back he went 12 times and I was all OMG it might not take 4 years!! And then he realized that the whole potty situation wasn't just his idea. He slammed on the brakes and I'm scrambling because not even M&Ms are working any more. Which is just maddening because see Exhibit A: full weekend of success when he felt like it. Then I remembered Bear's visual schedule and stuck it back on the wall. So far, Dude's quite enthusiastic about it and keeps going into the bathroom to name the items on the list. He won't actually do them when I ask yet... but this is autism, people! It's a step in the right direction and I'm calling it progress. 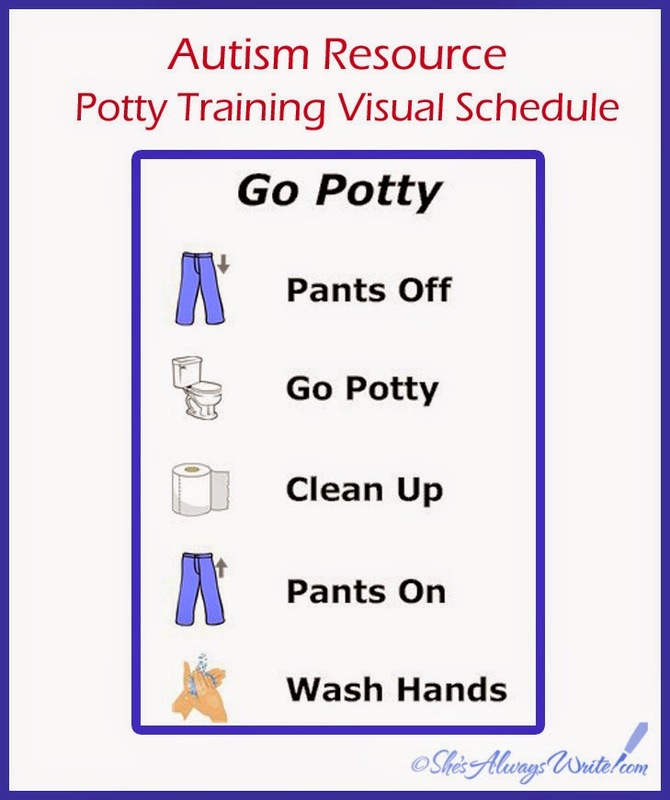 If you think this might be helpful at your house, you can download a free printable PDF of this potty training visual schedule here. It fits on a normal sheet of paper. I laminated mine because, well, I didn't laminate the first one and it got all mangled from enthusiastic hands pointing at the pictures halfway through the washing step. This post is pinned to my Autism & Sensory Processing Disorder board. If that strikes fear into your heart as well, come sit by me and have coffee split a bottle of wine while I tell you all about my new secret weapon: Tagxedo! As many of you know, I was reluctant to go down the Pinterest rabbit hole. That said, if it wasn't for my new religion I'd never have found this amazing site. I had to start a whole new pile of post-it notes (i.e. gestating pins-to-be) just for all the ideas I have for using it. And no, they're not paying me. They don't even know I exist. Well, maybe they do now, since yesterday I ponied up a donation to thank them for saving my neck here in the land of small children and people who expect homemade cards from them. Anyway. 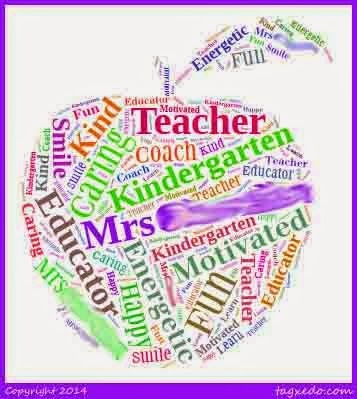 Teacher week. You've so go this. 1) Go to the Tagxedo site. You can point it at something like a blog post or type in your own. The default settings make repeated words show up bigger, so if you want the person's name to be really big put it in a bunch of times. 3) Play around with colors and fonts and shapes until you lose your mind. Click the History button to go back through thumbnails of all the versions. Finally settle for one 43 clicks back you're pretty sure you liked better than the one 27 clicks back. Be sure to choose a larger resolution if you plan to print (I usually pick 4MB png). I prefer to crop the colored border with the site name on it before I make the card. I print it on the bottom half of a standard letter size piece of card stock so when you fold it in half, it becomes the cover of a card you can write inside. It's a piece of cake to do in Photoshop but you can also do it in Word pretty easily. Since my son struggles with writing, I also added a simple message so all he had to do was sign his name. You can easily leave yours blank if it's no big deal for your kiddo to write a little thank you. I used a Kindergarten manuscript / letter learning font because I thought it was cute in this context and because I wanted my son to be able to read it. You might want to make your own with something fancier. If you want to use the message I made, you can download this PDF. 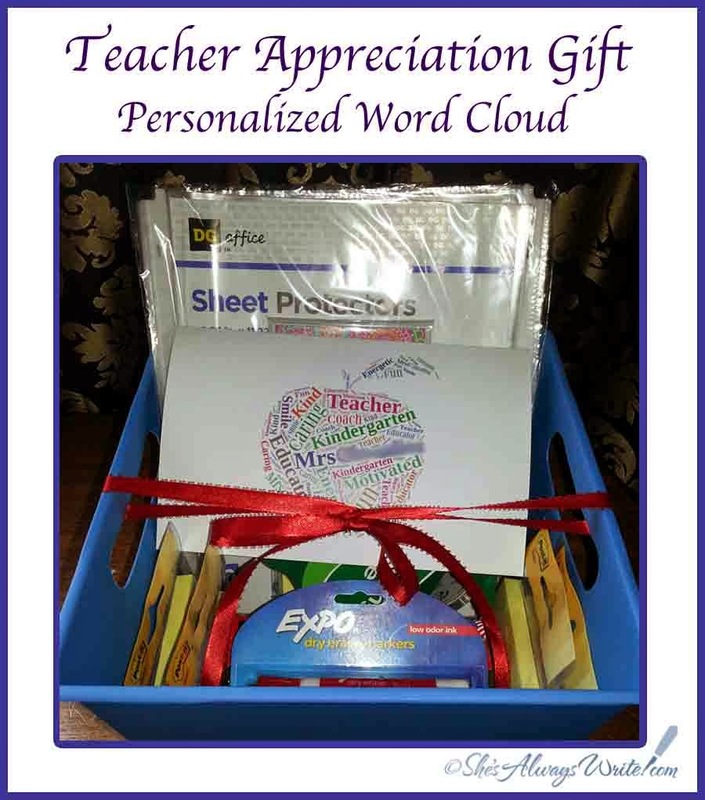 Just flip over the card stock with your word cloud printed on it so the interior message gets printed on the back and is oriented correctly when the card is folded. If you're me, this takes 6 tries. Spatial relationship skillz! I don't have them. Fold the card and have your kiddo write what needs to be written. Voila! 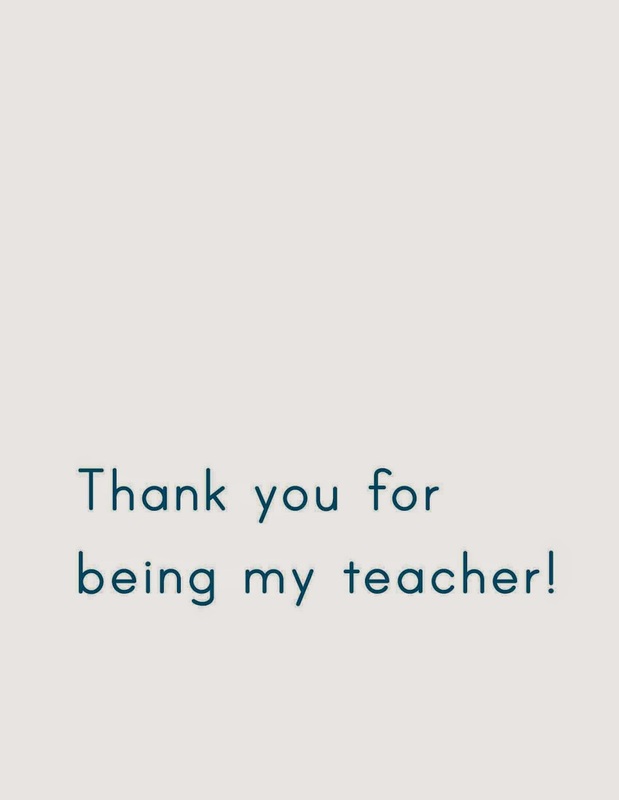 Teacher = appreciated. Most people just send the card, but I haven't been able to do much for the class lately due to work. So I poured all that working mommy guilt into a gift basket of school supplies from the class wish list. I put the card on that. Or, in my world, you get to be the one who puts in all this works and sets it on the shelf right next to the door so you won't forget but the special needs transport arrives 15 minutes early with a different driver they'd failed to notify you about and you're frantically trying to get shoes on your kid sooner than his routine dictates while preparing him for the idea he's never before seen the person about to drive him and then the substitute driver starts the damn van while he's walking in front of it and completely freaks him out and then you finally get him settled and sent off and you come back in and see the gift sitting on the shelf, right where you left it. This post? I totally pinned it. 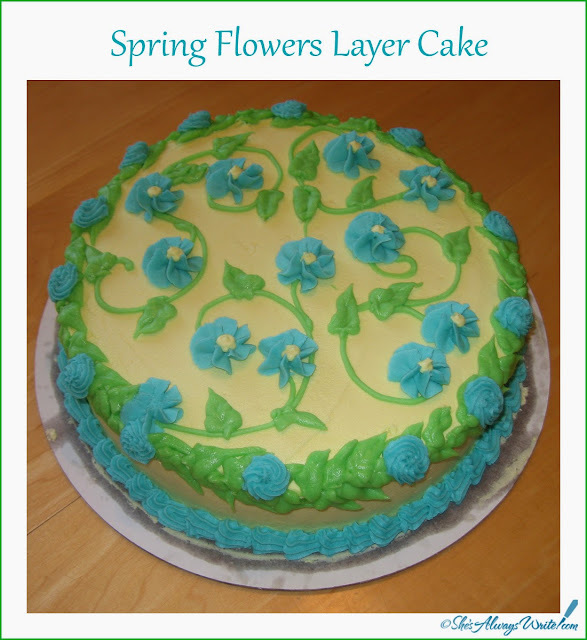 I made this on a whim when we were having friends over for a springtime cookout, and I was really happy with its cheerful simplicity. It only takes beginner level skills and I think it could be a nice offering for a bake sale, brunch, or outdoor gathering. The color scheme is ideal for a baby shower, and it could even work for a casual bridal shower. I used my go-to old school Betty Crocker cookbook yellow cake recipe because it's foolproof, sturdy enough to stand up to manipulating and generically tasty enough that no one's going to complain about wishing it was chocolate (Which... and I realize this is blasphemy... I find too heavy for warm weather desserts). If the April shower gloom starts getting to you, this is one one to bring your own May flowers. Here's my pin of this post.